Paperback, with flaps, 896 pages, 13.5 x 21.5 cm, 5.3 x 8.5 in. Eckart Conze, born in 1963, is a professor of modern and contemporary history. His publications include works on the history of Federal Germany, international relationships in the 19th and 20th centuries and the history of aristocracy in Germany. Professor Norbert Frei holds the chair of Modern and Contemporary History at the University of Jena and has written numerous books on the history of National Socialism and post-war Germany. Peter Hayes was born in 1946 and is professor of history and German at Northwestern University in Evanston, Illinois. In 2010 he coedited The Oxford Handbook of Holocaust Studies. Moshe Zimmermann was born in 1943 and is a professor of modern history at the Hebrew University Jerusalem. 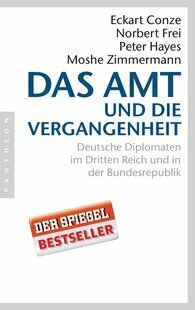 His most recent book is Germans against Germans: The Fate of the Jews 1938-1945 (Berlin 2008).